A new bill, introduced to New York City Council Wednesday, sets in motion, a plan to ban toy giveaways with high fat, high sugar meals. 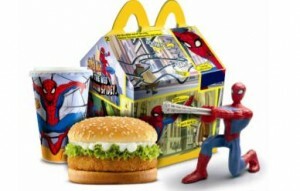 Dubbed the ‘Happy Meal Ban’, restaurants like McDonalds would have to stop including toys in their popular children’s meals. New York City is the most recent municipality to introduce this type of legislation, following San Francisco and Santa Clara County, California. Critics of the Happy Meal Ban prefer the onus to be placed on parents and caregivers to restrict the amount of high calorie foods children consume. They would like politicians to ignore that toy offers are used to market fast food products directly to children, thereby making children pawns in an unhealthy chess game between restaurants and parents’ ideal food choices. How many McDonalds meals have been purchased as a direct result of a child being lured in by the display of Happy Meal toys, and coercing their parents into purchasing a Mc-whatever instead of seeking out a healthier option? I don’t know the actual statistics but I know that there were at least two last week (one Happy Meal each for me and my son). It wasn’t my proudest moment, but I caved on that occasion, as many parents do, whether occasionally or on a more regular basis. Mason Smoot, vice president and general manager for McDonald’s New York region argues that childhood obesity is not caused by toys. “On average, kids eat at McDonald’s about three times a month; that means about 87 other meals are eaten at home, school or elsewhere. That adds up to a discussion larger than toys,” Smoot said. But legislators aren’t taking issue with the toys themselves; they’re taking issue with the high fat, high sugar meals the toys come with. The fast-food industry has recently improved the potential healthfulness of their kid’s meals by offering fruit and yogurt as alternatives to French fries, and milk as an alternative to pop. If these meals continue to become more nutritious, politicians are more likely to leave the toys alone. New York City has taken, what some might describe as, a heavy handed legislative approach to improving the healthfulness of the restaurant experience. Smoking was banned in bars and restaurants in 2003. They have also banned the use of trans fats in restaurants, require chain restaurants to openly display the calorie count of their menu items and have campaigned to reduce the amount of salt in food. On the opposite side of the coin, the state of Arizona approved a bill, in February, prohibiting municipalities from placing bans on toys and games given with children’s meals. Sniff, sniff, I smell lobbyists. Yes, it is the responsibility of parents to ensure that their children eat properly and live in a healthful way. But, the fact remains, that our society is experiencing an obesity problem. In some U.S. states, childhood obesity has topped the 30 percent mark. It is a problem we haven’t dealt with in the past. Parents need education and help in navigating the pitfalls of the modern food industry. They need the support of the restaurant industry or, failing that, they need the support of their government to help them make the best decisions for their children’s nutrition.